So anyway...: Silence. Mission Ends. 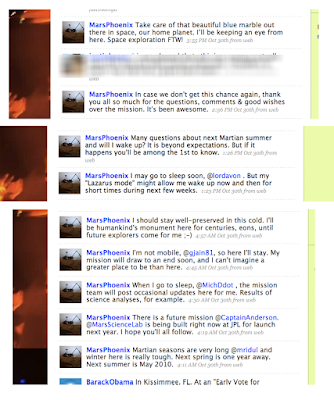 I've been following the latest mission to Mars on Twitter. I'm not really sure why. In the midst of updates from friends on three continents (here on Earth) and the middle of this country, reports of meals eaten, tasks procrastinated, momentous and quotidian life experienced, I've read the humorous, beyond-my-ken-or-passion scientific reporting of a robot in outer space. For reals. 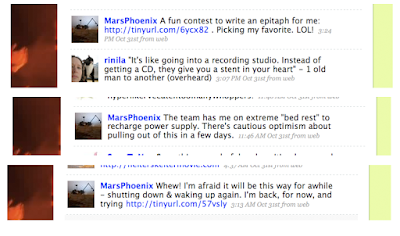 It's only natural, my Twitter friend Phoenix told me. Robots to Mars can't stay in communication with us forever. So, I will sit and watch the silence on my Twitter page. Another thing over. The rest of us carry on. 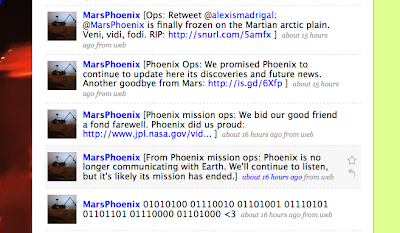 I loved the sweet good-bye - made all the more poignant by it being in binary code. One of my extremely geek friends who found a wife (GASP - I KNOW!) had the inside of her wedding band inscribed in binary code. She still doesn't exactly know what it means, but she thinks it's cute. "Bits of me will have to turn off, starting today." hard to think of a statement i've identified more strongly with in a while.